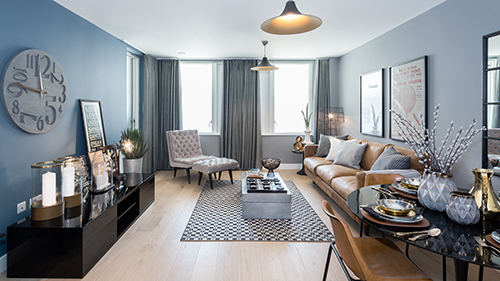 Carters Yard is a stunning development that delivers on uncompromising style and practical living in Wandsworth (travel zone 2). These spacious one, two and three bedroom apartments have been specifically created with first time buyers in mind and offer affordable routes to home ownership, including Help to Buy London and shared ownership. With striking exteriors and unparalleled interiors, these apartments have been considerately designed to challenge the thought that ‘affordable means compromised quality’. With fibre-optic connectivity, open-plan living spaces with engineered oak flooring and private balconies and terraces, designer handleless kitchens, luxurious bathrooms and more, these energy efficient homes truly exceed expectations. Beyond the beautifully secluded communal garden and excellent transport links (Waterloo and Oxford Circus can be reached within 25 minutes), a selection of apartments also benefited from stunning furniture packages provided by interior specialists, up to £19,000-worth of paid stamp duty and a contribution to legal fees – all to ease the burden for first time buyers.